Canadians are going to the Moon! At least that’s what a few headlines declared this past month. 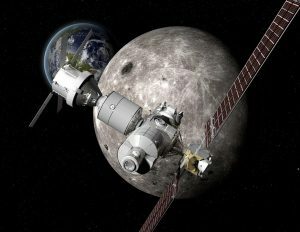 NASA is working on something called the Lunar Orbital Platform-Gateway (LOP-G), which is to be a semi-autonomous space station to be built in orbit around the Moon. And Justin Trudeau has committed Canada to this adventure, promising a contribution of about $2 billion over the next 24 years, and sending Canadian expertise in robotics, artificial intelligence (AI), and even probably a couple of Canadian astronauts. The depth of Canada’s involvement in space exploration might surprise some people; the sector already contributes over $2 billion annually to our national GDP. The vision for the LOP-G is, in essence, a small vehicle orbiting the Moon in something called a “near rectilinear halo orbit in cislunar space”, a spatial positioning whose specific definition and details would surely put most readers to sleep with its mathematical obscura. Much smaller in scale than the International Space Station (ISS), LOP-G could operate without a human presence (hence the need for advanced AI), but would also host small teams of visiting astronauts delivered by either NASA’s new deep space transfer vehicle, the Orion, or by one of the growing number of private sector competitors offering human-occupied space transit. SpaceX, whose crew-rated Dragon capsule triumphantly passed a demo test flight to the ISS a few weeks ago, is one such commercial option. The components of the LOP-G would be delivered by NASA’s new heavy lift vehicle, the ridiculously overpriced and overdue Space Launch System (SLS). Humans have not left low Earth orbit, let alone been to the Moon, since the 1970s. The scale of difference between the two locales is difficult for most people to imagine. But consider that the ISS is about 400 km straight up. The highest space shuttle flight was in 1997 when the Discovery delivered the Hubble telescope to an orbit 620 km above the Earth’s surface. Our GPS satellites, all delivered by unmanned rockets, are in geostationary orbit about 35,000 km away. But the Moon is staggeringly over 380,000 km away, well into the dangerous wilderness we call “deep space”, where hard radiation and other terrors lie in wait. For the last forty years, all humans have done is piddle about in our own font yard. Returning sustainably to the Moon means crossing the street and going to another neighbourhood. This endeavour is, by any description, daring and exciting. But some observers are not particularly sanguine. Amazingly, the most common criticism of the plan is that it is not ambitious enough. Legendary astronaut, and the second man to walk on the Moon, Buzz Aldrin argued that the LOP-G plan is “absurd”, if the actual goal is indeed to enable exploration of the lunar surface. Aldrin is more a fan of a strategy put forth by another legendary space theorist, Robert Zubrin, who described his “Moon Direct” plan in a recent issue of The New Atlantis. Zubrin’s plan calls for the building of one or two bases on the surface of the Moon, and the development of a Lunar Exploration Vehicle (LEV), which could shuttle astronauts across the lunar landscape and across the void between the Moon and the Earth, whereupon an Orion or Dragon could brave the final dangerous descent back to terra firma. Zubrin insists that his plan is dramatically less expensive and more sustainable than the LOP-G, and would rely less on untested and costly new NASA hardware, such as the SLS. And yet decision makers are committed to the more expensive LOP-G option. Why would that be? And what’s in it for Canada? In a word, the answer is commercialization. The Space Race of the 1960s was all about Cold War politics, with the USA and USSR seeking to demonstrate superior industry and technology, and therefore presumably superior ideology, by conquering heaven itself. The current lunar Space Race is about a few other things. There is some political capital and nationalist clout to be found, to be sure. With China landing a probe on the Far Side last year, and announcing their intention to build a Moon base of their own, and with both the Russians and the Indians making noises about a lunar presence, it’s clear that the 21st century’s great powers are looking to express their status by standing atop the literal high ground. But whether it’s mining rare minerals, preparing for the eventuality of lunar space tourism, testing new technologies for deep space missions to Mars and the asteroid belt, actually constructing the proposed reusable Mars transit vehicle away from Earth’s magnetic fields, or developing in-situ manufacturing technologies, opportunities for the burgeoning space private sector are accelerating. The LOP-G, then, is in large part a multi-use platform for diverse commercial exploitation. Private ventures from all partnered nations could conceivably use the LOP-G to develop and test landing and transfer vehicles, and even stage the construction of private surface colonies. In a recent interview on the SpaceQ podcast, Chad Anderson, CEO of space investment firm Space Angels, commented that the general public will be shocked at the amount of money to be made from a lunar economy. The enormous industrial potential for low gravity manufacturing is barely imaginable. And lunar soil is rich with what scientists call KREEP (potassium, rare-earth elements, and phosphorus), which is useful for making a multitude of products, from wind turbines to solar panels, parts of hybrid cars and, of course, weapons. Here on Earth, China presently has a near-monopoly on these elements, and recently reduced its exports, causing panic among global maufacturers. This lays bare another point of strategic relevance for the LOP-G: as a lever in the burgeoning Cold War with China. Helium-3 is famously thought to be abundant on the surface of the Moon. This rare element will be critical in the anticipated multi-billion dollar nuclear fusion economy, and is presently only gleaned as a byproduct of nuclear weapons production. National, strategic, and commercial interests in the Moon transcend the symbolic triumphs of the previous Space Race era, and are now centred about the control of tangible exotic materials. Beyond those materials is the expertise to be wrought from the adventure itself: skills and technologies vital to the new international order. AI is prime among them. Much has been written about the percolating AI Cold War between East and West. A semi-autonomous lunar space station will be greatly dependent on advances in AI, as will surface mining and manufacturing endeavours. LOP-G might be a lever for accelerating investments in AI development, which is where Canadians are well positioned to benefit in the short term. Canada is home to several of the world’s AI research hubs, but is hobbled by a technology adoption lag. LOP-G might go a long way to addressing that lag. In short, Canada’s early and enthusiastic partnership with NASA on the LOP-G initiative is a far-sighted investment to ensure this country’s prominence in the new economic order. It might also be a sign that we are taking sides in what might be a new technological Cold War.